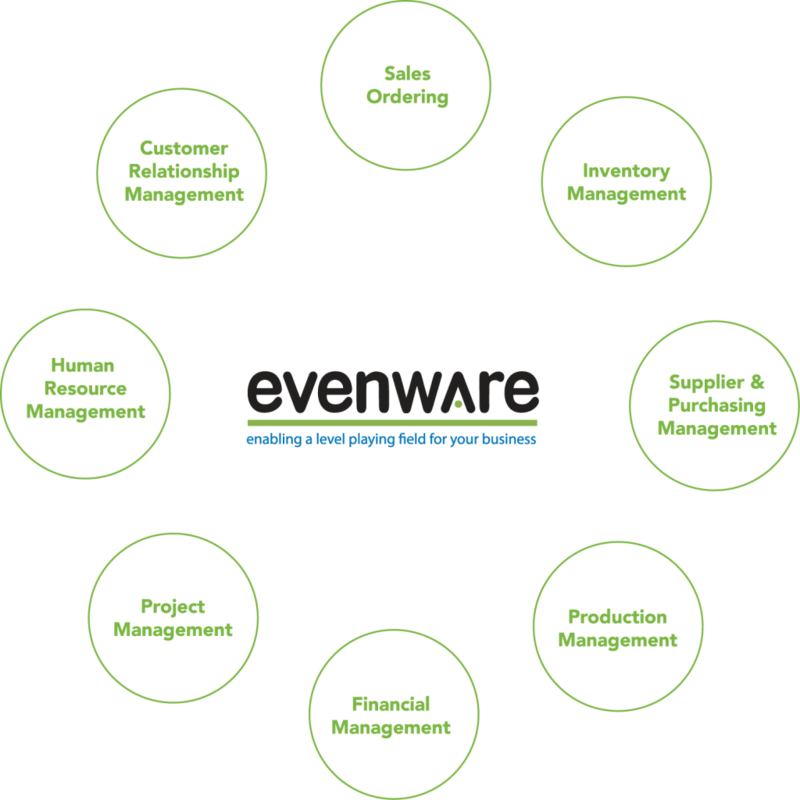 Evenware is a cloud based enterprise management software that includes; Sales Order Processing, Customer Relationship Management (CRM), Inventory, Purchasing Management, Project Management, Production Management, Human Resource Management (HRM) and Financial Accounting functionality. The system automates the business processes of organisations to enable employees to work from anywhere using 4G/Wifi based iPad/Android tablets, laptops and desktops. The system is a web based hosted solution and a separate instance is setup for each new client, ensuring data security. The project begins with client engagement and a complete study of their business processes, improvements to processes, documentation of new processes and customising them into the system functionality. Once client data is imported into the system, samples of their printed documents are created in the system as printouts, their own password protected instances are created and their employees can start working on the system immediately. Check inventory, place orders, invoice and schedule despatch seamlessly. This enables reducing the “order to cash cycle” of your business and allows transparent review of progress anytime. If you are currently using an accounting software and want to maximize your salespeople’s time by not coming back to office to process paperwork, Evenware makes this possible for you today ! This will make your business, as capable as any of your bigger competitors, and that is why we believe that we, “enable a level playing field for your business”. WANT TO KNOW HOW OUR PRODUCT CAN HELP YOUR COMPANY? Date and Time based appointment booking and product/service items billing into that appointment. Select existing customer from Database or enter new customer, add product/service items, Print Invoice/Bill. Complete inventory management functionality with part numbers, serial numbers, expiry dates, goods received and goods issue. Purchase Requisition creation, Purchase Order generation and Print. Project workflow creation and tracking of tasks. Production workflow tracking and management. Human Resource database and tracking of perfomance. Customer Database and customer contact tracking by Salespeople and system generated transactions. Tracking of Revenue and expenses and generation of Profit and Loss and Balance Sheet statements.